It was a one-man show for Ukraine's President Petro Poroshenko on Sunday as he held a lonely debate at the country's largest sports stadium ahead of next week's presidential runoff. Comedian Volodymyr Zelenskiy, who won the first round of the election on March 31, didn't make an appearance at Kiev's 70,000-seat Olimpiyskiy Stadium. With Zelensky absent Sunday, Poroshenko stood in front of an empty lectern with the comedian's name written on it and spent nearly an hour talking about his platform and answering questions from the media. Some in the crowd chanted: "Vova (diminutive of Volodymyr), come out!," urging Zelenskiy to make a last-minute appearance. 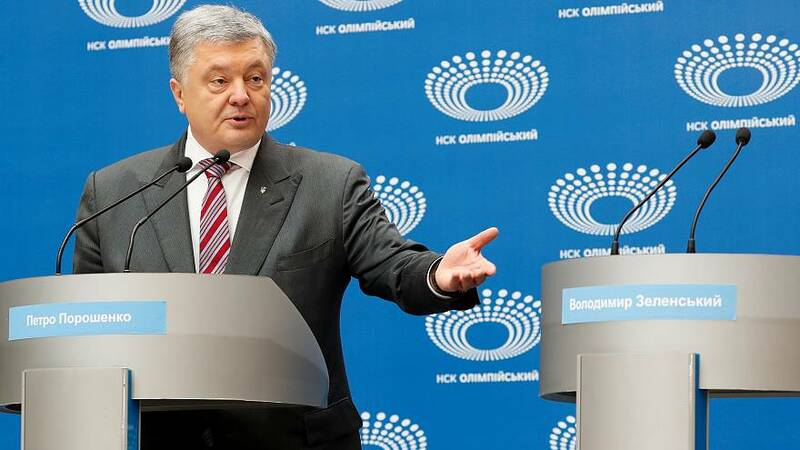 On Sunday, Poroshenko quipped that he was not holding a "press conference" and was "simply waiting for Zelensky [to show up]." He lashed out at the comedian, comparing his campaign to a "silent movie" and saying that Ukraine does not need a "virtual" president — a reference to Zelenskiy's frequent use of social media to talk to his voters. 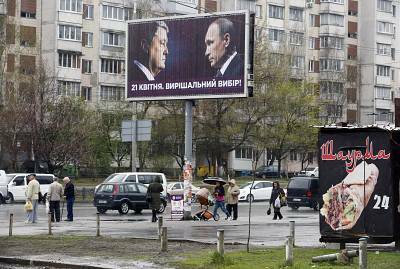 "When a candidate just appears on the screen and says nothing, it's just a scene from Servant of the People," Poroshenko said, referring to a TV show in which Zelenskiy plays a history teacher turned president. In an interview with Ukrainian channel ICTV Monday, Poroshenko said: "I believe that the debate is a key element of democracy."